Pre-K begins their journey with the New-York Historical Society! During this nine session enrichment program we will examine how people lived long ago through using a combination of authentic touch objects, and images of works of art, artifacts , and documents from the collections of the New-York Historical Society Museum & Library. Each session focuses on specific topics highlighted in the curriculum in order to deepen student’s understanding of the past and how life in the past was different than life today. In session one, students were introduced to the N-YHS and the concept that life was different a long time ago. 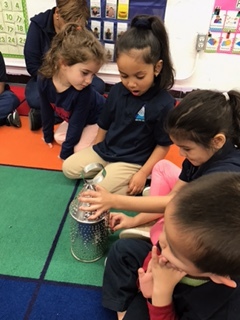 Students looked at photos of the museum and looked at a lantern and flashlight to compare the difference and understand how light has been used then and now. In session two, our N-YHS educator taught us what portraits are, how they were made and how portraits teach us about people. We learned that they were used before cameras were invented to take photos of people. After examining portraits from long ago, and looking at a paintbrush and palate, students drew a portrait of their teacher! Previous Entry:First Graders Make Their Characters Come to Life!